For over 13 years Best Stainless has been the premier suppliers of stainless steel 316 or 316L. Stainless Steel 316 or 316L SS is a Chromium-Nickel stainless steel with added molybdenum to increase corrosion resistance and mechanical properties. It is non-magnetic in the annealed condition and not hardenable by heat treatment. Please contact Best Stainless for more information about how 316 SS can best suit your specific application. Depending on the application and performance requirements we also provide 316/316L stainless steel casting equivalents, CF8M (316) and CF3M (316L). Our stainless steel bar stock lengths range from the industry standard 12' to 28' long. 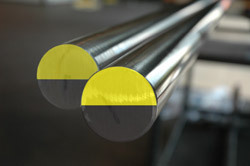 For projects requiring long length stainless steel bar, our inventory ranges from 20’-28’ R/L.